Millbrook Revolutionary Engineering (Millbrook RE), which is part of Millbrook, is establishing a brand new, independent and impartial test facility in the San Francisco Bay Area, California, to support the development of electric vehicles. Millbrook RE had doubled its capacity in Detroit within the last 12 months. This month, on the first anniversary of its ownership by Millbrook, it had announced the expansion into California to support some of its customers locally to their operations. This approach will enable more effective powertrain development support, create extra capacity and enable rapid introduction of new powertrain test capabilities. In addition to electrified drivetrain testing Millbrook RE is well known for, the new test facility will offer Vehicle-in-the-Loop (VIL) test capabilities and battery simulators to 1,000V DC / 1,200A DC peak. This will enable customers to perform complex integration testing and to validate electrified powertrain components, laid-out powertrains and electric vehicles. The facility will be designed for maximum flexibility and will be equipped with high-speed motors up to 20,000rpm allowing tests of electric motors and inverters or standalone drivetrain components. The new facility will serve as a showcase for Millbrook RE’s turnkey dynamometer-based test systems. It will also be a base for its service engineers supporting systems installed in customers’ facilities locally. Millbrook RE’s support team provides a rapid response to service requests which include maintenance and calibration. This entry was posted in Electric Vehicles and tagged electric vehicles, EV, Millbrook prooving ground, Millbrook RE, Millbrook Revolutionary Engineering on April 15, 2019 by Tim Cosgrove. Chargemaster is the operator of the UK’s largest EV charging network and the leading supplier of EV charging infrastructure. Acquisition is an important step in scaling up and deploying a fast and ultra-fast charging network on BP’s UK forecourts. Chargemaster to be rebranded BP Chargemaster. BP today announced that it has entered into an agreement to purchase Chargemaster, the UK’s largest electric vehicle (EV) charging company. Chargemaster operates the UK’s largest public network of EV charging points, with over 6,500 across the country. It also designs, builds, sells and maintains EV charging units for a wide range of locations, including for home charging. Tufan Erginbilgic, chief executive, BP downstream, said: “Bringing together the UK’s leading fuel retailer and its largest charging company, BP Chargemaster will deliver a truly differentiated offer for the country’s growing number of electric vehicle owners. The number of EVs on the road is anticipated to increase rapidly in coming decades. By 2040 BP estimates that there will be 12 million EVs on UK roads, up from around 135,000 in 2017. The development of convenient and innovative EV charging technologies and networks is a key part of BP’s strategy to advance the energy transition. BP is committed to developing new offers to meet changing customer demand and growing new businesses and supporting opportunities for customers to reduce their emissions. BP believes that to accelerate the adoption of EVs, customers will require convenient access to fast and ultra-fast charging. BP’s UK retail network is well positioned to provide this access with over 1,200 service stations across the country. A key priority for BP Chargemaster will be the rollout of ultra-fast charging infrastructure, including 150kW rapid chargers capable of delivering 100 miles of range in just 10 minutes. BP customers in the UK can expect to access BP Chargemaster chargers on forecourts over the next 12 months. Founded in 2008, Chargemaster runs POLAR, the largest public charging network in the UK. The POLAR network now includes over 6,500 public charging points. The company has over 40,000 customers of its POLAR network, of which an increasing number choose to pay a monthly subscription, and the remainder access on a pay-as-you-go basis. Chargemaster is also a leading supplier of home charging points across the UK and has strong links with car manufacturers, as the charging partner for a number of car brands in the UK. Upon completion of the transaction, Chargemaster employees will continue to be employed by BP Chargemaster or its subsidiaries. BP Chargemaster will operate as a wholly-owned BP entity. This entry was posted in Electric Vehicles and tagged BP, BP Chargemaster, ChargeMaster, electric vehicles, EV on June 28, 2018 by Tim Cosgrove. A fourth London bus route has turned all-electric, thanks to a partnership between BYD and ADL, Go Ahead London and Transport for London. 11 of the 10.8 metre BYD ADL Enviro200EV single decker began servicing route 153 at 5 am on Saturday 3rd February, based out of the Northumberland Park Garage in Tottenham and travelling between Finsbury Park and Moorgate in the City of London. BYD also supplied the depot with its self-designed and manufactured charging points. 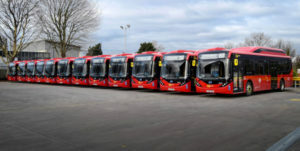 The Enviro200EV buses have already provided safe and efficient service on three other routes operated by Go Ahead London, with other routes and operators to receive fleets of BYD ADL electric buses in the future following tender wins by the partnership. “We are delighted to make another significant step in the electrification of London’s bus routes and to be in the vanguard of the transformation. At Go-Ahead we have developed considerable practical knowledge of electric bus operation, gained over six years, and are well positioned to contribute further to the improvement of the capital’s air quality”, said Richard Harrington, Go-Ahead Group’s Engineering Director. “The smooth switch on of our electric buses to operate another intensive London route is a testament to the strength of our overall offering – not just the proven and reliable buses themselves but of the back up and support of our partners in planning and installing the necessary equipment to make electric bus operation successful from day one”, said Frank Thorpe, UK Country Manager for BYD UK, speaking on behalf of the ADL BYD partnership. This entry was posted in Electric Vehicles and tagged Bus and Coach, BYD UK, electric vehicles, EV, Go Ahead London, London Buses, TfL on February 16, 2018 by Tim Cosgrove. Northern Powergrid, the company responsible for the network that keeps the lights on for 3.9 million homes and businesses across the North East, Yorkshire and northern Lincolnshire, and the leading electric vehicle manufacturer Nissan have signed an industry-leading partnership. The two organisations, through a new Memorandum of Understanding (MOU), will work together to explore a range of innovation projects over the next six years. The projects will look at how electric vehicles (EV), batteries and other technologies can support energy networks. They will also explore how new technologies can enhance the capacity, capability and resilience of the region’s power network to make it more active and responsive to the growing and changing demands of both domestic and commercial customers. The partnership also represents another step forward for Nissan’s Intelligent Mobility blueprint in Europe, which aims to demonstrate how electric vehicles like the Nissan LEAF – the world’s best-selling EV – can work in tandem with energy providers and grid infrastructure to deliver a cleaner, more efficient energy networks. Vehicle-to-Grid (V2G) technology, for example, allows electric vehicles to be fully integrated into the electricity grid, improving network capacity and helping to make renewable energy sources more affordable and more widely available. It also provides an opportunity to create mobile energy hubs, by integrating large numbers of electric vehicles directly with the grid. This enables Nissan LEAF owners to connect and charge their vehicle during low-demand, cheap tariff periods, and use the electricity stored in the vehicle’s battery at a time when costs are higher, or even feed it back to the grid to generate additional returns. Following the signing of the MOU, Northern Powergrid and Nissan will work together over the coming months to develop plans for a series of projects. Project learnings will be shared in due course. Pictured: Patrick Erwin, policy and markets director at Northern Powergrid, with the 100% electric Nissan LEAF. This entry was posted in Vehicle-to-Grid V2G and tagged electric vehicles, EV, nissan, Nissan Motors (GB), Northern Powergrid, V2G, vehicle-to-grid on May 26, 2017 by Tim Cosgrove. ChargePoint, the world’s largest electric vehicle (EV) charging network, today announced it has secured an initial $82 million in funding, part of a larger multi-million dollar fundraise, led by Daimler. The first close of the company’s latest fundraising round is the largest in the Silicon Valley company’s history. The investment will support the expansion of the company’s charging network into Europe, enabling the region to complete the shift to e-mobility. Existing investors BMW i Ventures, Linse Capital, Rho Capital Partners, and Braemar Energy Ventures also participated in this latest fundraising round. To date, ChargePoint has raised more than $255 million, a testament to ChargePoint’s proven business model that underscores a collective commitment to electric mobility worldwide. As more types of vehicles become electrified, such as trucks and buses, this new funding will help ensure ChargePoint is ready. ChargePoint already makes it easy for drivers in North America to charge an EV everywhere they go, with more than 33,000 charging ports where they can refuel. Thousands of drivers have selected ChargePoint to meet EV charging needs with more than 6,500 companies selecting the brand for their employees, customers, fleets and tenants. Now, ChargePoint is committed to bringing EV drivers in Europe the same level of convenience that makes the charging experience effortless. ChargePoint also announced the appointment of Daimler AG executive Axel Harries to the company’s Board of Directors. Harries has a deep history with Daimler, serving in a number of management roles including Vice President of Quality and Director of Mercedes-Benz G GmbH, as well as on teams including Commercial Vehicles and e-Business. In his current role, Harries is responsible for shaping the newly established CASE-unit within Daimler (Connected, Autonomous, Sharing & Services, and Electric Drive), charged with developing technologies and innovations for next generation Mercedes-Benz vehicles, particularly the new electric product brand, EQ. “While pursuing the systematic expansion of our CASE ecosystem based on our new product brand EQ, we also remain open and ready for partnerships and cooperation at the highest level. ChargePoint is a company of experts in the field of electric mobility charging solutions with a great deal of know-how in both hardware and software. Together we will be able to significantly expand the product portfolio in the area of intelligent charging solutions and provide the customer with an all-embracing premium offer for electric mobility,” he said. ChargePoint is the only company that offers a charging solution for every part of an EV driver’s life—at home, at work, around town and on the road. This comprehensive product portfolio positions ChargePoint to offer the right innovation for each market in Europe and meet a variety of driver needs. Painstakingly engineered by EV charging experts, ChargePoint hardware and software solutions make it easy for drivers to charge and simple for station owners to manage with custom access controls, pricing and reporting tools, among other smart features. In addition to advancing e-mobility in the region with innovative technology, ChargePoint will build on its long history in North America of promoting EV-friendly policies through partnerships with policymakers, utilities and automakers in Europe. More than 20 European countries already provide attractive incentives for purchasing EVs, which has helped make Europe the world’s second-largest EV market. As more EVs hit more European roads, the need for a comprehensive charging network is more important than ever. Currently, there are dozens of providers of EV charging hardware, software and driver networks in a fragmented market. They all work differently and often require drivers to sign up for separate accounts, which creates a confusing and cumbersome charging experience for EV drivers. ChargePoint is committed to being the first company to introduce a complete charging solution that serves EV drivers in Europe everywhere they go. By collaborating with innovative companies like Daimler, one of the largest producers of premium vehicles and a world leader and pioneer in automotive electrification, ChargePoint will be able to lay the foundation for Europe’s most comprehensive and intelligent charging network. This entry was posted in Electric Vehicles and tagged Chargepoint, daimler, electric vehicles, EV, EV charging network, EV charging points, EV charging stations, EV Europe, Mercedes-Benz Vehicles on March 7, 2017 by Tim Cosgrove. French oil and gas giant Total is planning a network of electric vehicle charging points at its petrol stations across France, the company’s Chief Executive Patrick Pouyanne said on Tuesday. “We plan to do it. We are thinking of how to equip our stations with electric charging points,” Pouyanne told journalists at the sidelines of the SER renewable energy conference in Paris. Pouyanne said the company was looking at installing the charging points mostly outside city centres and was talking to car makers such as PSA. “Our plan consists of looking at how to create a charging point network around French highways to have charging points every 150 or 160 km (100 miles),” he said, adding that there was demand from clients. This entry was posted in Electric Vehicles and tagged charging points, electric vehicles, EV charging points, Patrick Pouyanne, renewable energy, SER renewable energy conference, Total, Total France on February 7, 2017 by Tim Cosgrove. BMW Group, Daimler AG, Ford Motor Company and Volkswagen Group with Audi and Porsche have signed a memorandum of understanding to create the highest-powered charging network in Europe. The goal is the quick buildup of a sizable number of stations to enable long-range travel for battery electric vehicle drivers. This is an important step toward facilitating mass-market battery electric vehicle adoption. The projected ultra-fast charging network with power levels up to 350 kilowatt will be significantly faster than the most powerful charging system deployed today. The buildup is planned to start in 2017. An initial target of about 400 sites in Europe is planned. By 2020, consumers should have access to thousands of high-powered charging points. The goal is to enable long-distance travel through open-network charging stations along highways and major thoroughfares, which has not been feasible for most battery electric vehicle drivers to date. The experience is expected to evolve to be as convenient as refueling at conventional gas stations. The network will be based on Combined Charging System standard technology. The planned infrastructure expands the existing technical standard for AC and DC charging of electric vehicles to the next level of capacity for DC fast charging with up to 350 kilowatt. Vehicles engineered to accept the full power of the charge stations can recharge brand-independently in a fraction of the time of today’s battery electric vehicles. The network is intended to serve all Combined Charging System-equipped vehicles to facilitate battery electric vehicle adoption in Europe. The automobile manufacturers intend to make substantial investments to create the network, underscoring each company’s belief in the future of electric mobility. While the founding partners – BMW Group, Daimler AG, Ford Motor Company and Volkswagen Group – will be equal partners in the joint venture, other automobile manufacturers will be encouraged to participate to help establish convenient charging solutions for battery electric vehicle customers. The joint venture also intends to cooperate with regional partners to ensure a quick network realization. This entry was posted in Uncategorized and tagged electric car cgarging station, electric vehicles, EV, ultra-fast dc charging stations, ultra-fast EV charging network on December 9, 2016 by Tim Cosgrove. Chargemaster will be supporting the wireless charging on the official safety and medical cars and be providing legacy charging infrastructure to the cities visited by the series. Following the growth of the FIA Formula E Championship – the world’s first fully-electric single-seater racing series – and a successful first year’s partnership, Chargemaster is delighted to announce a new two-year contract as the Official Charging Infrastructure Supplier to Formula E including the support of wireless charging of the official course cars. Ahead of this weekend’s race in Marrakesh, Chargemaster’s announcement is hot on the heels of three major vehicle manufacturers – Audi, Jaguar and Mercedes-AMG – confirming that they will intend to have factory-backed teams joining the series. Growing in stature, the 2016/17 calendar consists of 12 rounds, starting last month in Hong Kong and finishing in Montreal, Canada in July 2017. As part of the two-year deal, Chargemaster’s technicians will support the wireless charging of the official course cars, including the BMW i8 Qualcomm Safety Car and the BMW i3 medical car. This is paramount to ensure each is fully charged, and can be on-hand to support the race as soon as required. In addition to assisting with charging on-site at Formula E race events, Chargemaster works directly with local cities to establish charging infrastructure in each location. Each hosting city is offered a number of Chargemaster units, boosting awareness and making it easier for local EV drivers to stay charged and on the go. Chargemaster is the UK’s largest provider of EV charging infrastructures. At present it operates a 5,500-strong public POLAR network, and has supplied over 30,000 homes with its Homecharge units. The FIA Formula E Championship is the world’s first fully-electric single-seater racing series, competing on the streets against the backdrop of some of the most iconic cities – including Hong Kong, Marrakesh, Buenos Aires, Monaco, Paris, New York and Montreal. The championship represents a vision for the future of the motor industry, serving as a platform to showcase the latest innovations in electric vehicle technology and alternative energy solutions. Future seasons will see the regulations open up further allowing manufacturers to focus on the development of motor and battery components, which in turn will filter down to everyday contemporary electric road vehicles. The 2016/17 FIA Formula E Championship sees 10 teams and 20 drivers go wheel-to-wheel in 10 cities spanning five continents in the fight to be crowned Formula E champion. The inaugural season of Formula E sparked into life in September 2014 around the grounds of the Olympic Park in Beijing. The third season of the electric street racing series gets underway on October 9 in Hong Kong, with the season finale double-header in Montreal on July 29 & 30. This entry was posted in Electric Vehicles and tagged Alejandro Agag, BMWi8, ChargeMaster, electric vehicles, EV, FIA formula e on November 28, 2016 by Tim Cosgrove. The UK’s premier electric vehicle (EV) charging point supplier, Chargemaster has featured on the Sunday Times Hiscox Tech Track 100 list for the third consecutive year, meaning that it has once again posted exceptional sales growth. The league table lists the UK’s top 100 fastest-growing private technology companies, based on their sales over the last three years. Chargemaster first appeared on the table in 2014, and is ranked 66th on this year’s list. Chargemaster’s third consecutive appearance on the Tech Track 100 list demonstrates the impressive sales success that it has enjoyed in recent years. Its UK manufacturing facility now produces 2,000 EV charging units each month, with the company supplying its 50,000th charger this year. The company’s focus on quality products and services has meant that it is well-placed to serve the growing EV market, partnering with a number of electric vehicle manufacturers, such as Mitsubishi, Nissan and Tesla. It has also joined forces with the AA, to educate motorists about the benefits of owning an EV. The Sunday Times Tech Track 100 is compiled by Fast Track and was published in the Sunday Times on September 11 2016. This entry was posted in Electric Vehicles and tagged ChargeMaster, David Martell, electric vehicles, EV, Tech Track 100, The Sunday Times on October 10, 2016 by Tim Cosgrove. Chargemaster has revealed its new UltraCharger, a rapid charger for electric vehicles, which modernises electric vehicle charging through a number of innovations. Unveiled at leading low-carbon show LCV2015 by Anna Soubry, Minister for Small Business, Industry and Enterprise, the UltraCharger promises to revolutionise electric vehicle charging. Manufactured at the company’s plant in Luton, Bedfordshire, the UltraCharger is the only rapid charger to be designed and built in the UK. Chargemaster expects to build 1,000 units in its first full year and will be exporting the UltraCharger globally, with an initial focus on Europe. Measuring 120cm(H) x 60cm(W) x60cm(D), the UltraCharger is considerably smaller and lighter than previous rapid chargers on the market, meaning it does not need planning permission to be installed in many instances. Electric vehicle owners will not only be able to access the UltraCharger via an RFID membership card, but also a contactless debit or credit card. It can also be controlled using Automatic Number Plate Recognition (ANPR), meaning that on recognising a vehicle’s number plate, it will authorise the user and automatically start charging. With an improved user interface, which has a large 12-inch touchscreen with graphical display, users will be greeted personally on screen when presenting their card to the UltraCharger. Owners will also receive a text message to inform them when charge has reached a pre-set level. The UltraCharger offers three cables making it compatible with all EVs on the market that charge up to 50kW units. The design-focused unit is not only aesthetically improved on previous rapid chargers but also has cable retraction, removing untidy cables from view when not in use. Chargemaster CEO David Martell commented: “We’ve always been at the forefront of electric vehicle charging, and we’re proud to unveil the UltraCharger, which takes the industry a massive step forward in terms of modernisation. This entry was posted in Electric Vehicles, Technology and tagged Anna Soubry, chargenaster, David Martell, electric vehicles, EV, ultra charger on November 12, 2015 by Tim Cosgrove.